Hey quilty followers, it's Chris from 52Q here with a little year-end wrap up and update. It has been a great year for the 52Q, what was just a little idea that I was toying with in the run up to Christmas 2014, has become a huge project with a strong following across social media. 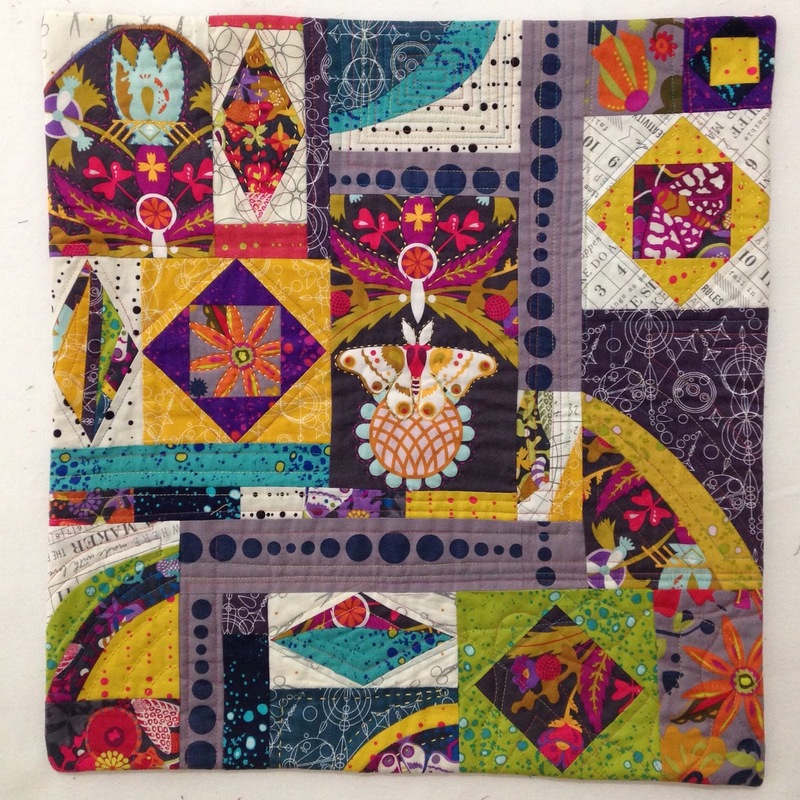 Over the course of 2015, 52 amazingly talented quilters shared their lives via our Instagram account. We also blogged and tweeted from time to time! 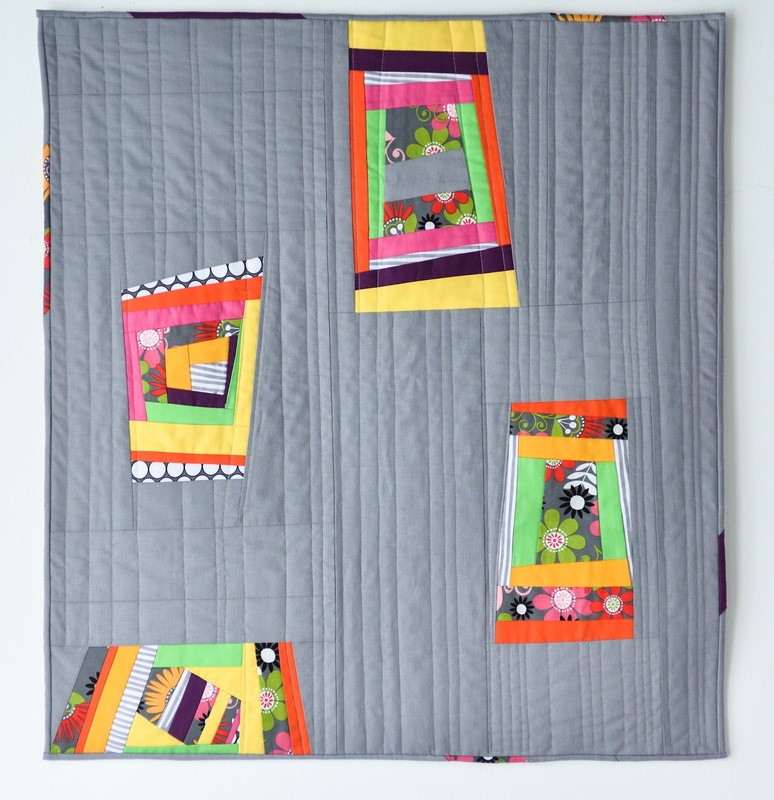 Do you remember all these wonderful quilters? What a year! Do you remember all these quilters? A big thank you to all of you: you've made the project a huge success, and I've learned lots from you along the way! As the year draws to a close we are getting ready to welcome another 52 Quilters into the mix! Many of you gave feedback and have shared what you'd like to see from the project, and so I'll be doing my best to make 2016 bigger and better! 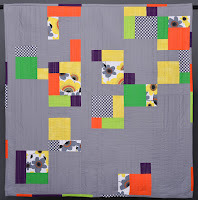 The 52Q blog has already had a fresh coat of paint with a minty-tangerine feel, and I'm recriuting new quilters! If you'd like to participate visit the get involved page and fill out the Google Form. Applications close on January 8, and everyone who applied will get a response by January 31. 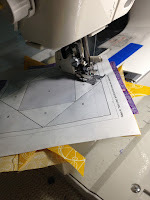 I couldn't end this week of blogging without sharing some of my personal experiences, thoughts, feelings, beliefs and goals as a modern quilter. First--a disclosure. 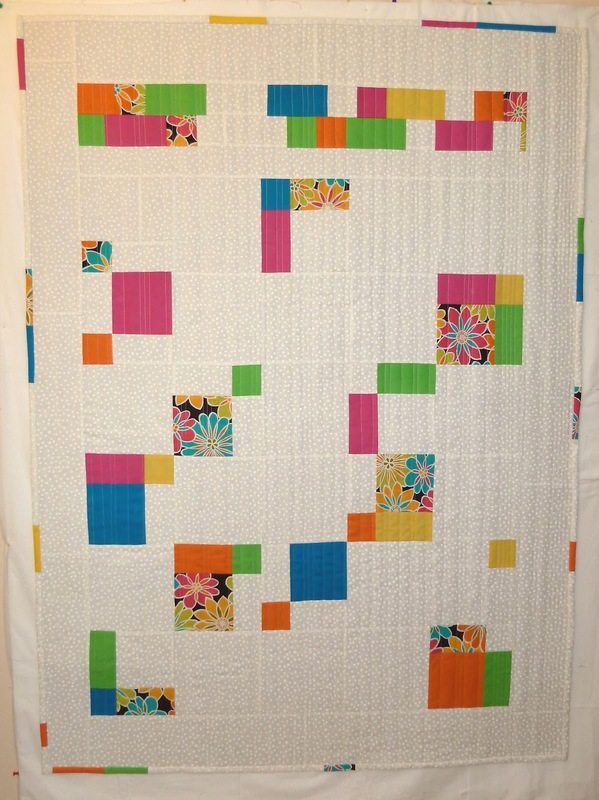 I co-founded a modern quilt guild in Sarasota FL over 3 years ago and our Guild joined The Modern Quilt Guild. Last year, I was elected to the Board of MQG. However, the views expressed in this post are totally just all about ME!!! 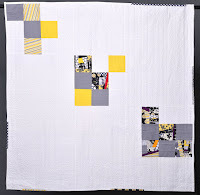 Confession time--although some of my older quilts were inspired by mid-century modern art, I wasn't sure I was a modern quilter. 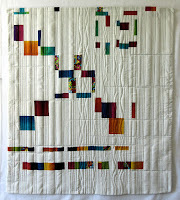 I was still very rooted in the artquilt world most of the time--these quilts were for the wall, not the bed. So, at our first Guild meetings in 2013, I didn't have anything new to show! And, guess what, it didn't matter because like my Guild friends, I was falling in love with what I was seeing on Instagram, Pinterest, Blogs and the MQG website. 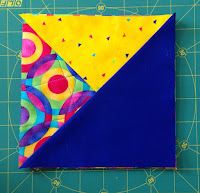 I was LEARNING what modern quilting was about and I liked it. 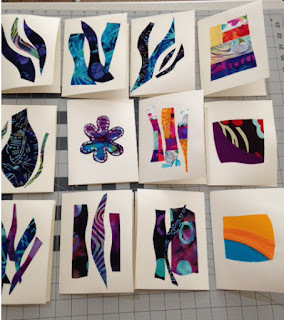 I felt energized, challenged and I just wanted to start designing my own modern quilts. Here's another modern quilt from 2014--it's a wall hanging. I started playing with gray and fracturing negative space. And, I simplified a 4 patch into a 3 patch. 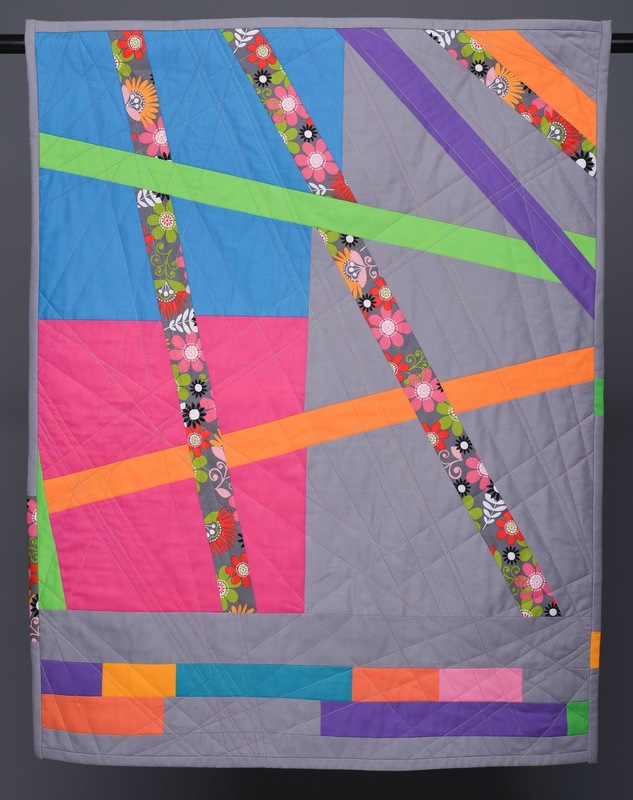 Modern quilts need to be well-made--modern does NOT mean sloppy, or falling apart when it's washed. So that meant I had to sharpen my rotary cutting, piecing and quilting skills a bit. Especially when I wanted to make larger lap quilts. I'd been so used to working in a smaller format that a quilt that measured 50 by 70 inches or more seemed ENORMOUS. And, well-made doesn't mean PERFECT! 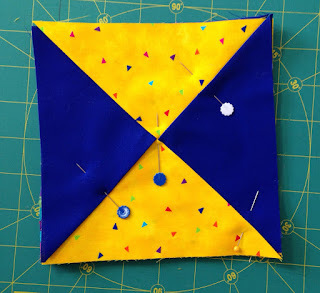 But, if I want my 9 patch points to match in that modern quilt, then, I really need to use the tools and skills to make that happen. The white disappearing 9 patch quilt above is one that I don't pull out often because it's not as well constructed as I would like. I learned a lot when I made it--it was just a rite of passage. It's a Really, Really Big Diverse World--and I LOVE that! The modern quilt world is full of people who want to try new things. They are curious about people who bring their cultural traditions to the modern world to enrich our dialogue with each other. 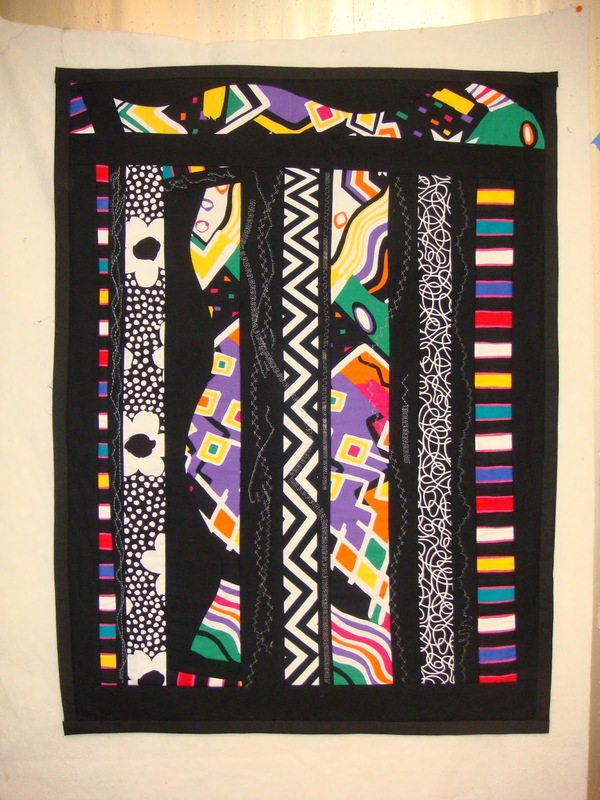 Yes, there are some design principles that modern quilters have embraced. We love asymmetry, open space, playing with scale, modern color palettes, etc..... We are inspired by mid-20th century modern art and architecture. 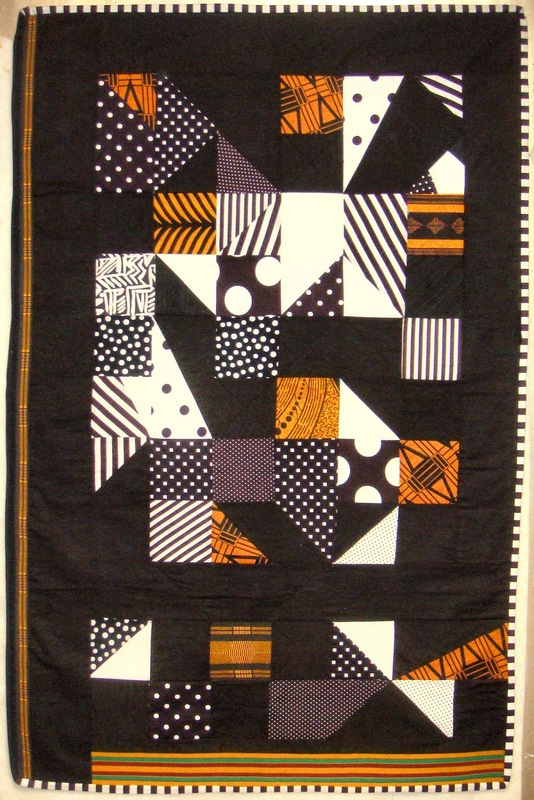 Like this quilt I made last year--it's a nod to Frank Lloyd Wright. And we modern quilters are inspired by quilt traditions like blocks that we love--here's a modern patriotic quilt idea I'm playing with. 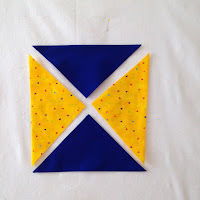 That star block is traditional and using 'USA' themed colors is also traditional. However, I'm sure I can bring those traditions into the modern quilt world. 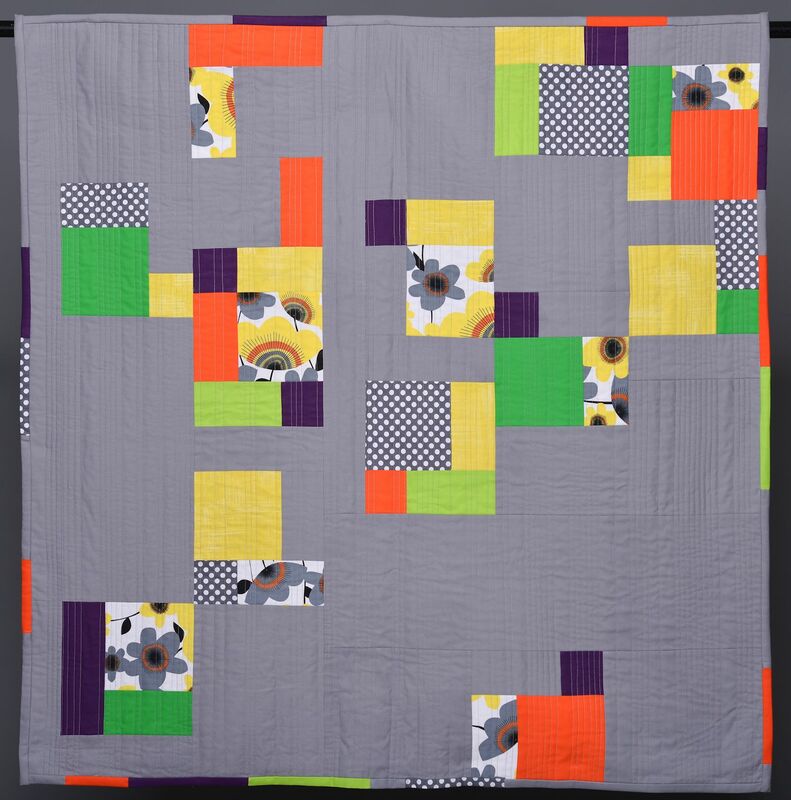 By the way, there are LOTS of MYTHS about what modern quilts are like. I've blogged about that in the past. 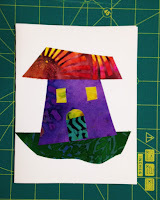 What aspects of modern quilting do I want to explore, reinvent, play with and learn about? As for me, I'm playing with how I can use saturated color as negative space--is that even possible?? In progress--experimenting with color and layout. 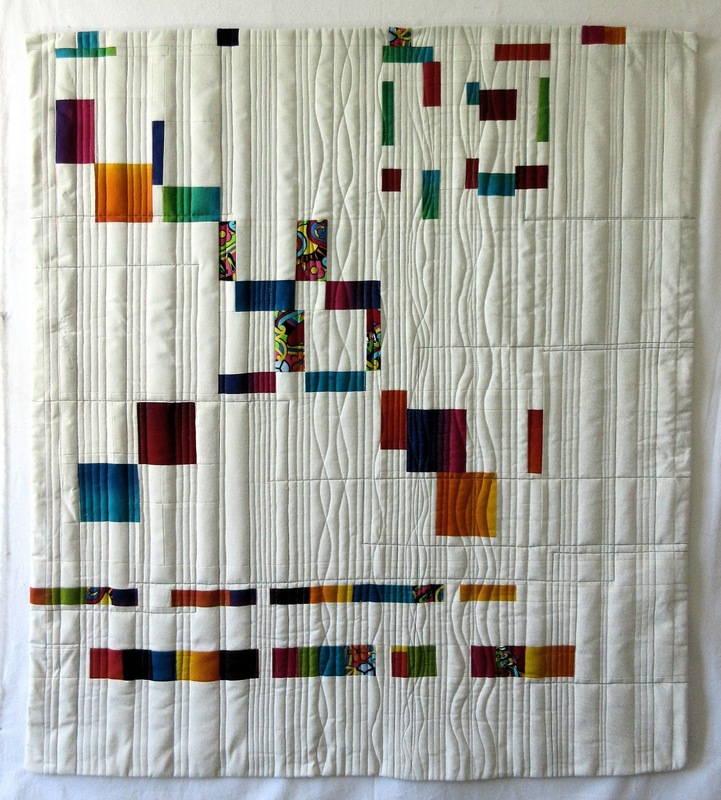 The final quilt will be exhibited at the Texas Quilt Museum --Modern Quilt Guild Juried Show. 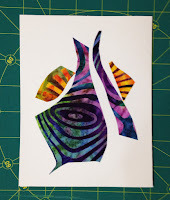 I'm curious about all these new modern batiks I'm seeing that have interesting graphics. How will they play with modern solids, prints or grunge or.....??? See the batiks in the in-progress quilt above? 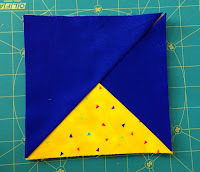 I'm using the mini-quilts I make for swaps to practice my machine paper piecing skills to make precision pieced blocks. I'm playing with scale and curves and precision pieced points--sometimes in the same quilt!! I'm (finally) writing a book with techniques and modern quilt designs that I'd love to see other modern quilters try out. And, above all, I'm having a lot of fun. 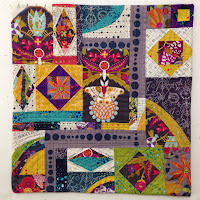 As a modern quilter, I feel free to follow my personal vision. 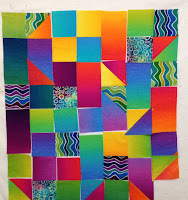 I love the awesome modern quilt community for its openness. 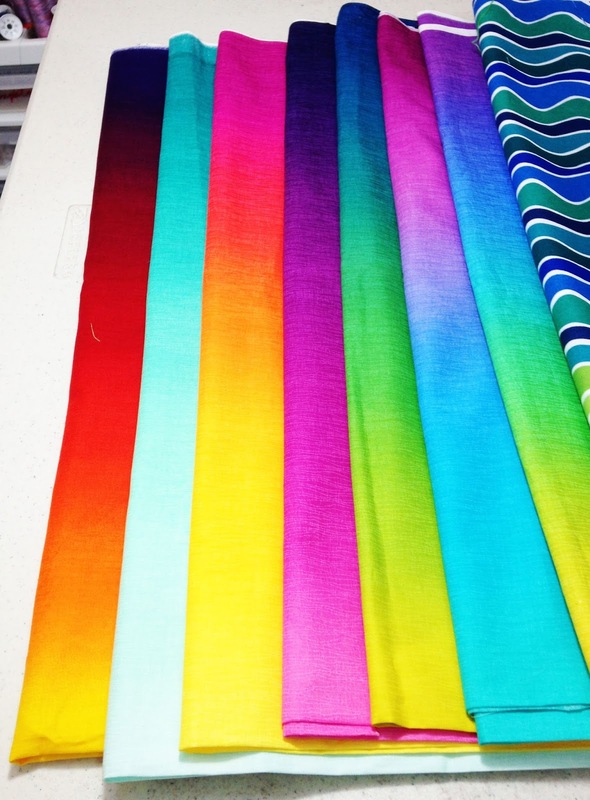 I appreciate the fabric manufacturing companies for seeking out and supporting new fabric designers who have a fresh take on graphic design. And, thanks to these companies for all these luscious new solids, ombres and grunge fabrics. I truly do not worry or pay attention to any nay-sayers or modern quilt police. You know, those critical quilters who only have negative things to say about work by others. Yes, we have quilt police in the modern world--they're so busy enforcing the so-called rules that they can't see what's happening right in front of them. Sadly for them, they are missing all the vibrant new ideas that are happily showing up in every corner of the modern quilt universe. My personal mission is to encourage and support ALL QUILTERS who want to join in this modern movement. That's why I'm writing my book, making new quilts, going to QuiltCon, supporting my Guild, blogging and teaching workshops. Lucky, lucky me that I get to live this creative life. 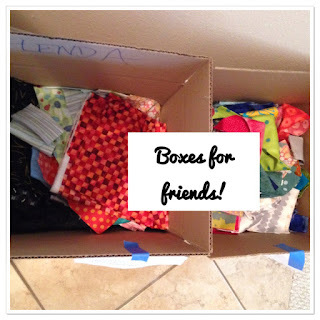 Well, this is my last post on 52 Quilters! Thanks so much for reading these postings. I appreciate all of you who have started following me on Instagram (@carole_lylesshaw). I hope you'll follow my future posts on my blog www.CaroleLylesShaw.com. In 2016, I'll have give-aways and other exciting announcements and I would love to see you there! Here's another really quick tutorial. I like making mug rugs--but I want to make them FAST because I'm often putting them in the Swap Quilt package that has to go in the mail in the morning. Here's a tutorial--I didn't invent this. I've seen different versions of this process in a lot of places, including on an episode of one of the TV quilt shows last year. Step 1: Cut 4 squares of fabric measuring 6-1/2 inches. I like large mug rugs so I start with larger squares. sometimes, I use 4 different colors or fabrics. In this example, I used 2 fabrics. 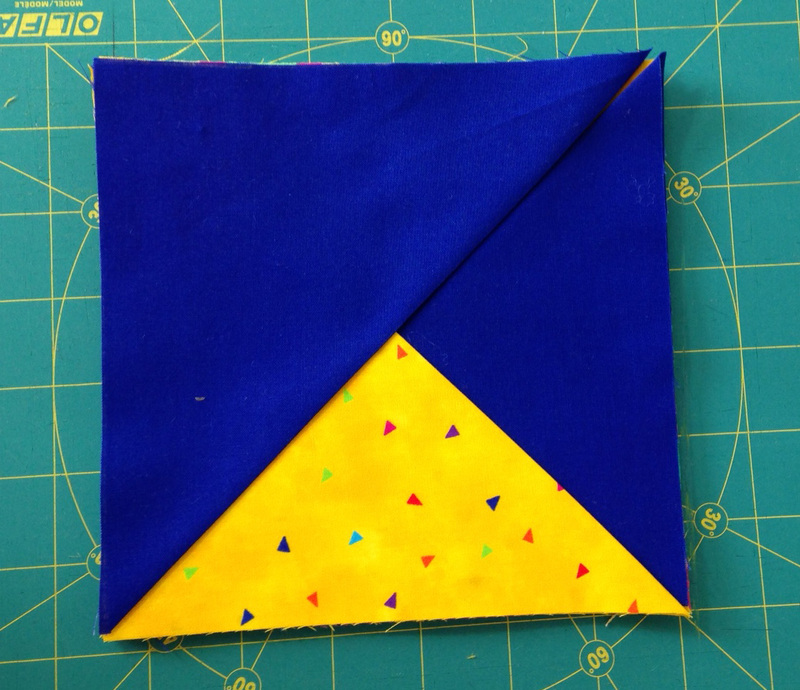 Fold these squares into triangles and set them aside. Step 2: Cut one square of fabric measuring 7 inches and a piece of batting slightly larger. I use cotton batting but you can use anything you like. This fabric will be your backing. Then, quilt these two layers. I use my walking foot and sew random straight lines or free hand curves. 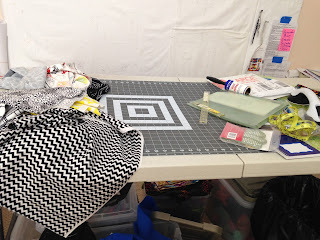 Because it's a mug rug, I take about 2 minutes to do the quilting--nothing fancy!! After quilting, trim down to 6-1/2 inches. 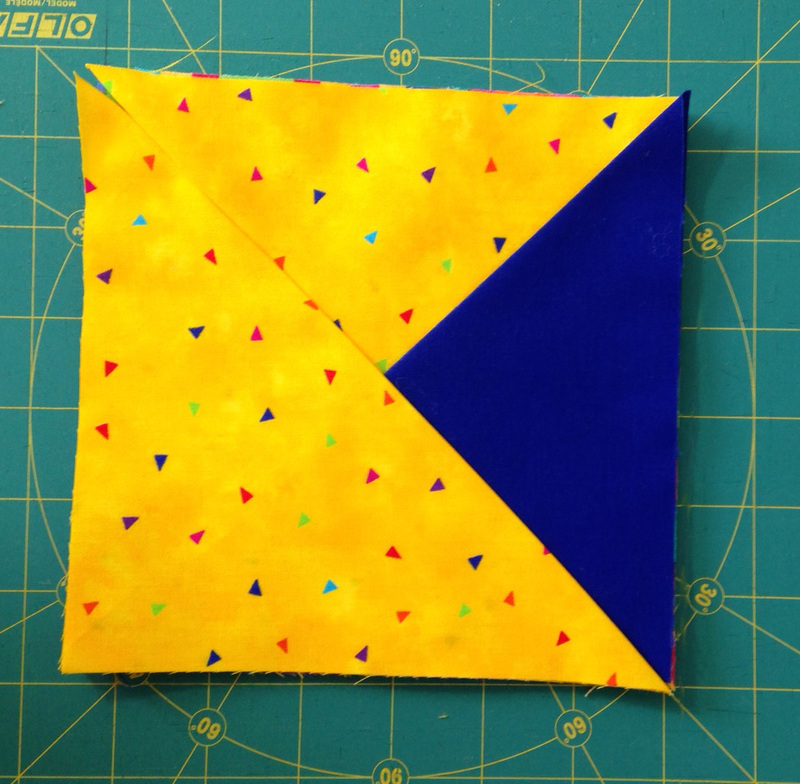 Layer your 4 triangles with the RIGHT SIDE of the back facing UP. 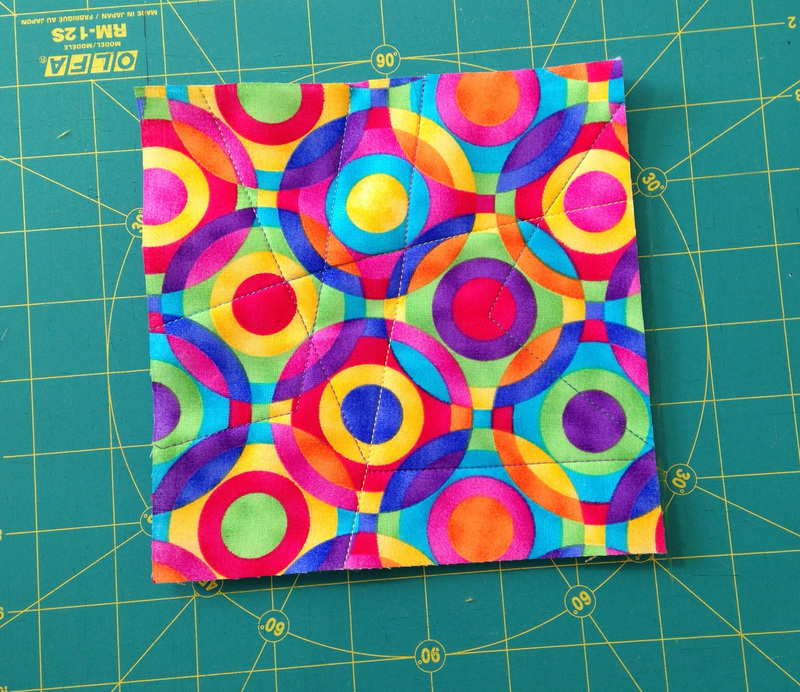 You'll be turning this inside out eventually so the backing will be on the back of the mug rug. The 2nd blue triangle is added and is on the top left. FOLD THE two triangles back and then put the blue UNDER the yellow. Your triangles are now interwoven. Pin them to hold them together for the next step. Step 4: Sew a straight stitch seam around all four sides. I use a quarter inch seam. Sew straight from one end to the other. In the photo below, you can see my seams. I clipped a bit off each corner to help me turn the mug rug inside out. You can just see the backing inside. I'll use the wooden point turner to help me get the corners shaped up. Turn the mug rug inside out! 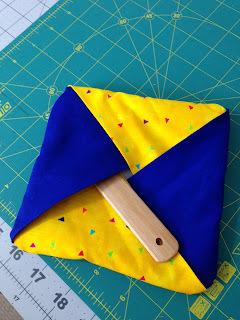 Step #5: Turn it inside out and use something sharp to poke out those corners. 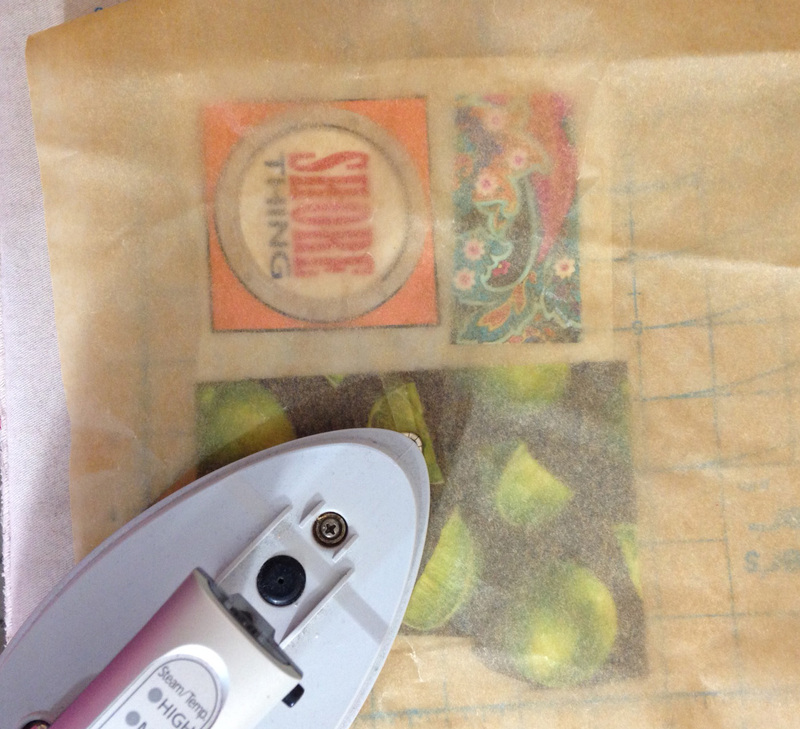 Poking the corners to get the mug rug square. 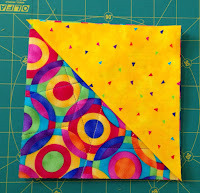 Add more quilting--As an option, you can add more quilting by machine or hand after you turn it inside out. 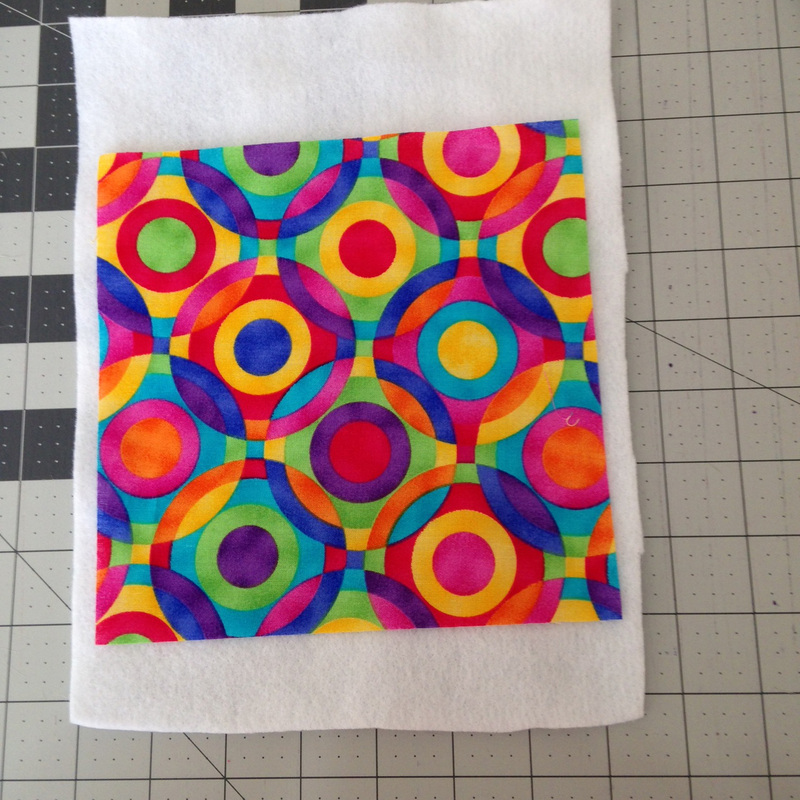 But remember that the back of the mug rug will be quilted. Sometimes I quilt a circle, spiral or small square right in the center. Make bigger mug rugs! I've used this same process to make a larger rug for my teapot to sit on--I'm a tea drinker! 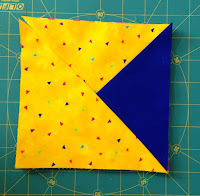 Use a pieced square instead of the triangles. 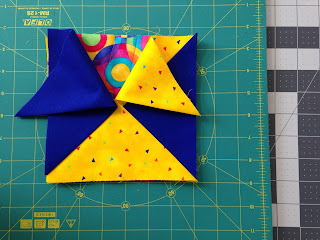 Sometimes I use improvisational pieced blocks as the back OR the front or BOTH. 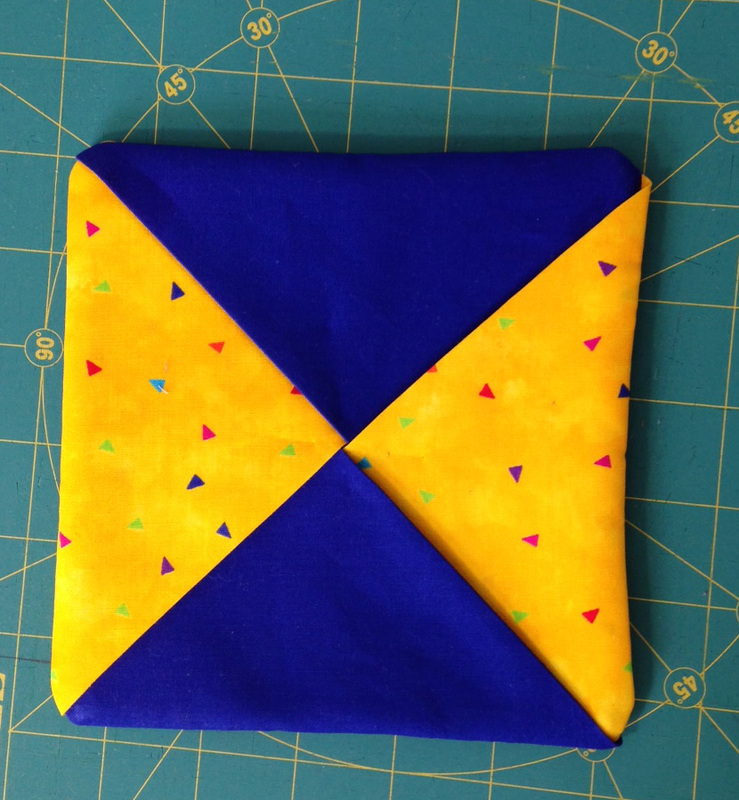 If I don't use the triangles, then I leave ONE side partially open when I sew around the edge in step 4. Then, I turn it inside out like a pillow case and stitch the 4th side closed by sewing around all 4 sides with a decorative stitch. There are lots of things about ME that keep me from getting things done--MEANING GETTING QUILTS FINISHED. By personality type...I am a Procrastinator. I believe that time is flexible and that magically, the time I need to finish a project will magically appear. There won't be any emergencies. My sewing machine will work perfectly. 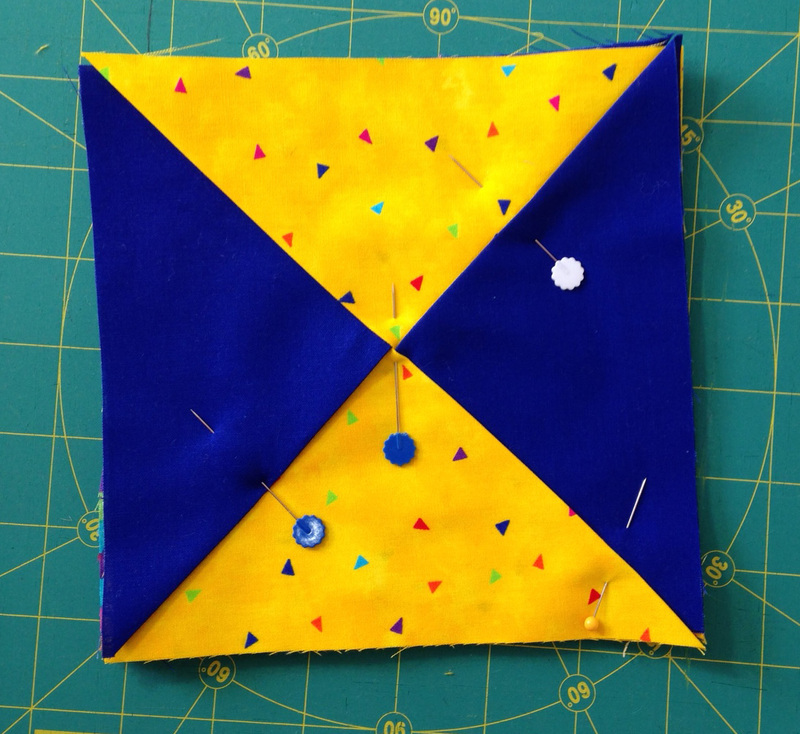 And, the binding will only take me 30 minutes to sew on a quilt that measures 36 by 40 inches [91 by 101 centimeters]. So, I'm likely to wait until 2 weeks before it's due to start designing. Meaning no fabric is selected, no design in mind for SIX WEEKS! Or...I'll pull a bunch of fabric and let the pile sit on the floor or the table for SIX WEEKS...After all, if I have the fabric, then I'm almost done, right! I have this MYTH that I get more creative when I'm under pressure. But, looking at my completed projects in the past year, I know this is NOT true. Why does this 15 minute rule work for me? What makes this a successful strategy? One word: Organization. 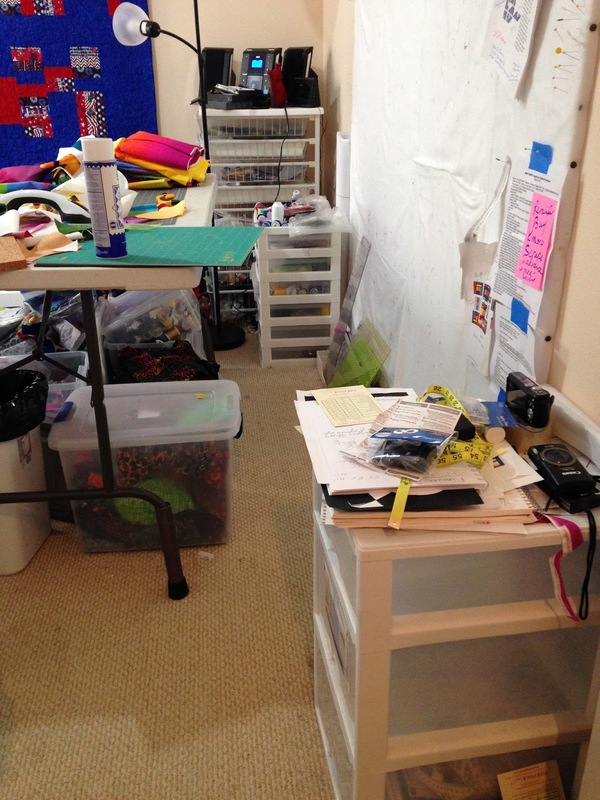 I'm lucky to have dedicated space for my sewing room and fabric storage. But I think these tips could work even if you have limited space or have to share it with another function. 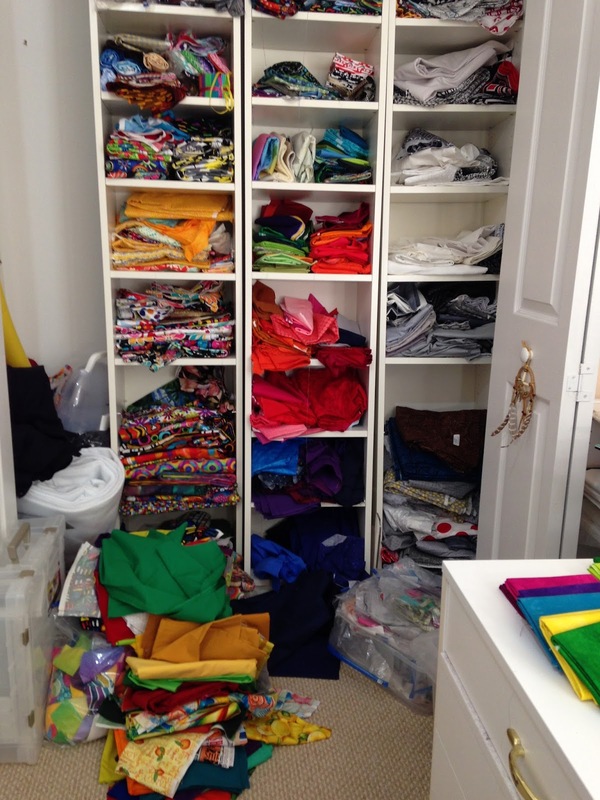 My first step was getting control of the fabric chaos that you see here. When I started, my shelves and the floor around them looked like this....and I had storage bins in the other room that were just as jumbled up. Other parts of my work space looked just as bad. 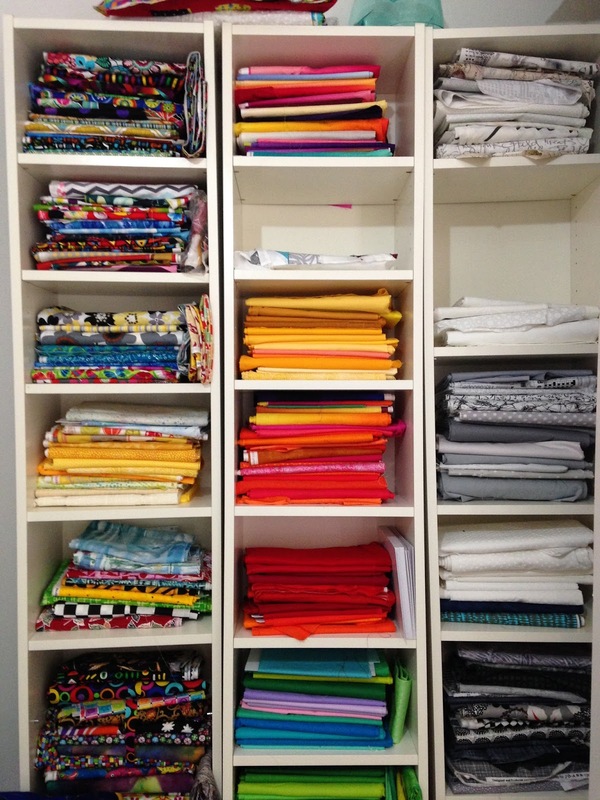 About a year ago, I took a few days and purged and organized my fabric by type (prints, solids, etc.) and color. I purged....bravely getting rid of fabric and miscellaneous crafty supplies that I knew I wasn't going to use anytime soon. The boards are made of acid free paper and even in humid Florida, I haven't had any problems. They're also cheap! I sorted and folded fabric for a couple days. I had a good audio book to listen to and that helped pass the time. When I buy new fabric, I IMMEDIATELY fold it onto the boards. This is a great task to do when you sit and watch TV. Here's what my main stash looks like today. These shelves are IKEA Billy bookcases and they are about 15 inches wide and 11 inches deep. You can adjust the shelves. I like this width because it's perfect for folding yardage on the comic book boards. I can see what I have but the fabric doesn't get too dusty or exposed too much to light. They sit in a closet and I can close the doors. I keep this stash looking pretty good. In addition, in another closet, I have several plastic bins with fat quarters (sorted by type such such as all low volume FQ's together) and a few bins of batiks and patriotic fabrics. 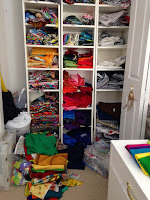 I'm about to purge some of the bin fabrics--I kept WAY too much and I have a friend who will put them to good use. Next stop was the rest of my room, including my main cutting table. In the old days, I let my cutting table end up looking like this. 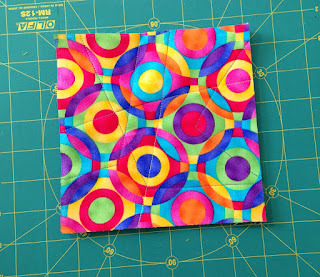 There was fabric I was working with, tools, measuring tapes--all jumbled up. How could I find ANYTHING!! 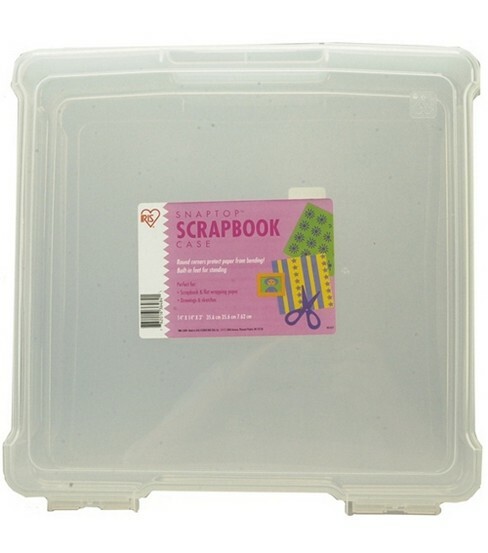 Now, when I start a project, I get out a plastic bin like this--It's an Iris scrapbook storage bin that measures 14 by 14 by 3 inches. I buy them from Joann's and recently they were on sale for about $4.00 US. 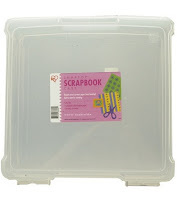 If I need space for more blocks or yardage, then I'll grab one of my larger plastic bins but the idea is the same. Here's a case with project materials in it. I'm ready to work on the next project. 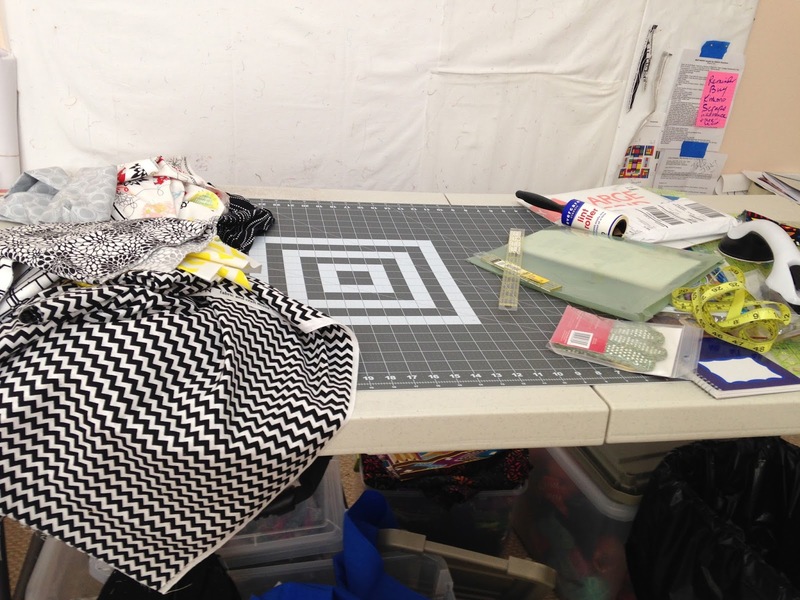 At the far end, I keep my rotating cutting mat, rotary cutter, my scissors, a couple of rulers and my glasses. I add a label to the project case with project name and probably a due date if there is one. Case open--Inside I keep printed instructions or other info, including paper piecing printouts. All the fabric and in-progress blocks would also be stored here. Sketches or EQ7 printouts for the layout wold be added. I took the fabric off the comic boards so I could get more in the case. 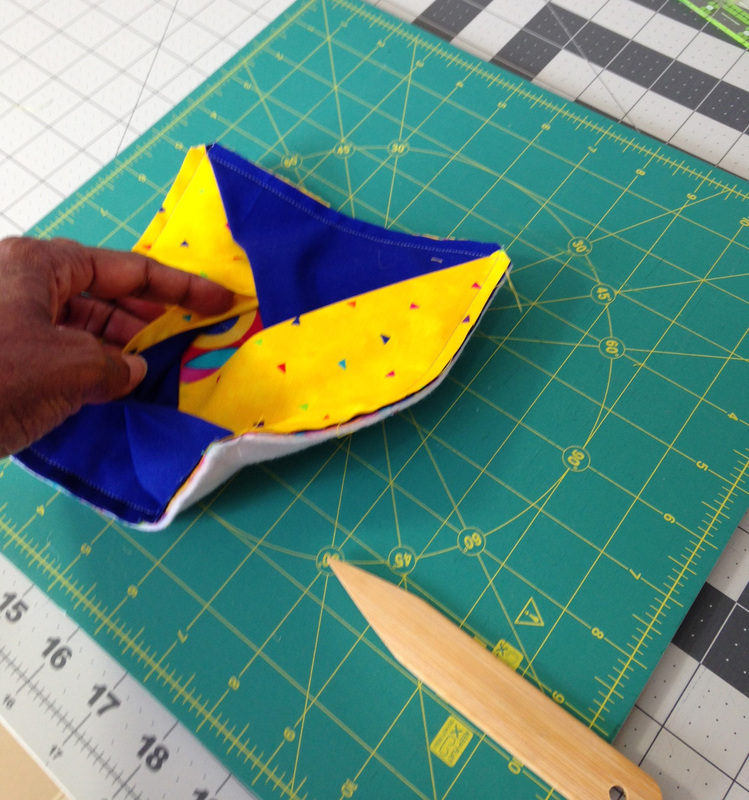 When I start working on a project, I get out the fabric and instructions (if any) for ONLY that project. So my worktable looks like this when I start. A calm space that just draws me in. I keep my rulers in a ruler organizer so I can quickly grab what I need. And, the project case is on the floor under the table so when I'm done cutting from the yardage, I can put the yardage back in the bin. 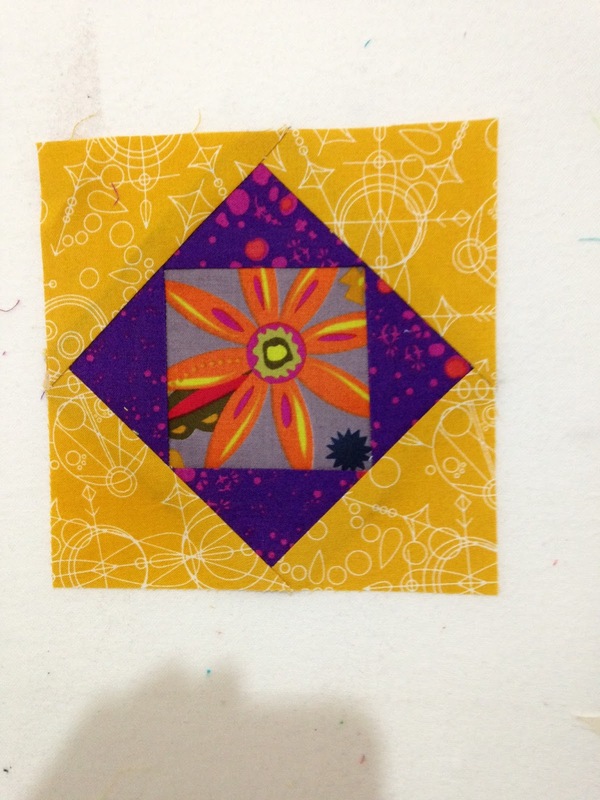 Ready for sewing a block. I only use Superior So Fine 50 wt for piecing and I keep a large spool on the thread stand on the left of my machine. Sometimes I use my 15 minutes to prewind a few bobbins for piecing. Remember the 15 Minutes? If I only have 15 minutes, I can start doing some cutting because my work space is already set up. No wasted time looking for the fabric or the block cutting instructions or my rotary cutter or whatever. When the project is completely done, I fold the yardage back on the comic boards and put it back on the shelves. I toss out miscellaneous notes unless I need them for pattern writing. Lastly, I keep myself organized by putting this chart on my wall. This one lists all Swaps and relevant information right in front of me. Staying organized has increased my productivity and decreased my stress level. I love walking into my sewing space and when it starts to get aout of hand....well, I know what to do to get it back in shape!! 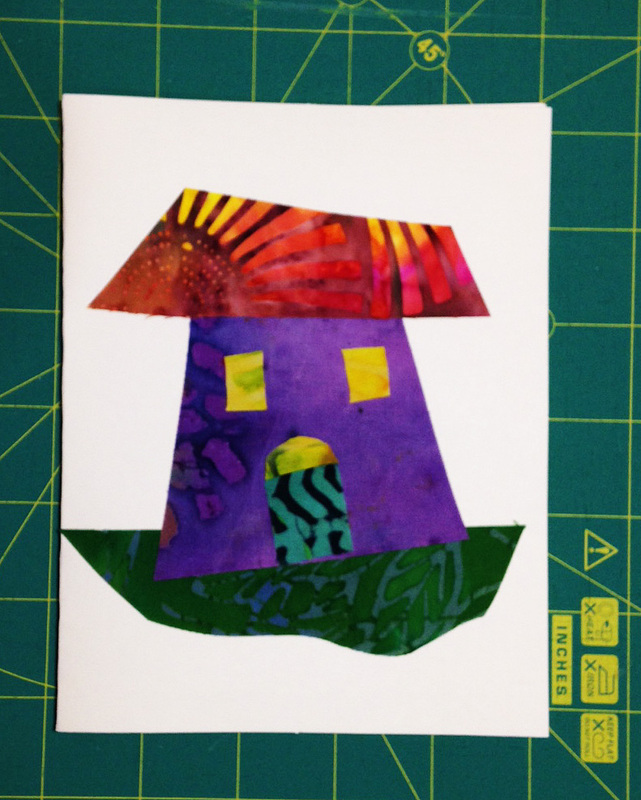 I'm writing my first quilting book...as we speak...and one of the projects will be an improvisational log cabin. 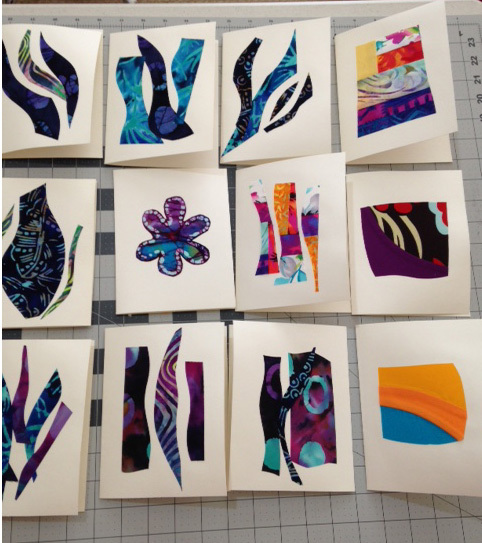 This post will give you a glimpse into my design/thinking process for improvisational work. 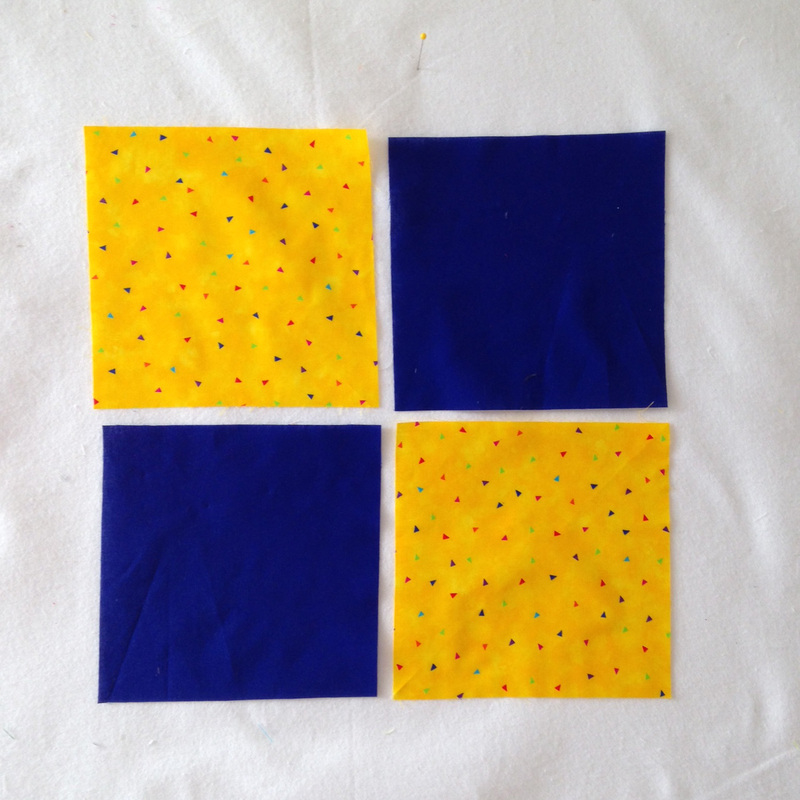 Then, I started fearlessly piecing small strips like this. The strip that's second from the left was a leftover test strip from another project. Its a free hand cut and pieced shallow curve with white and the print. The fabric with the flowers was my 'focus fabric'. You can see it in the next photo in the center of the block. I added other fabrics and began building some improv log cabin blocks. Another block started. 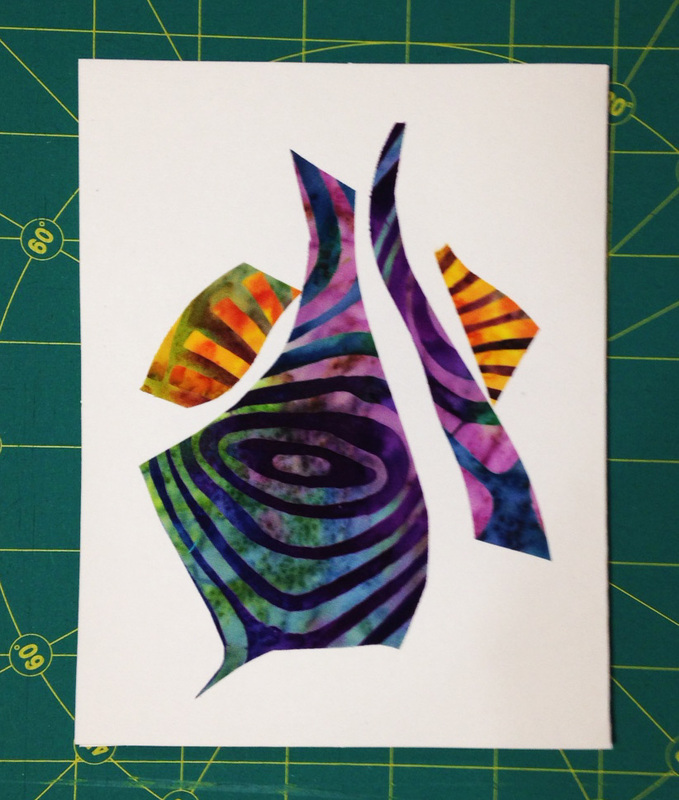 I used the stripe as the center and build around it in a traditional style. 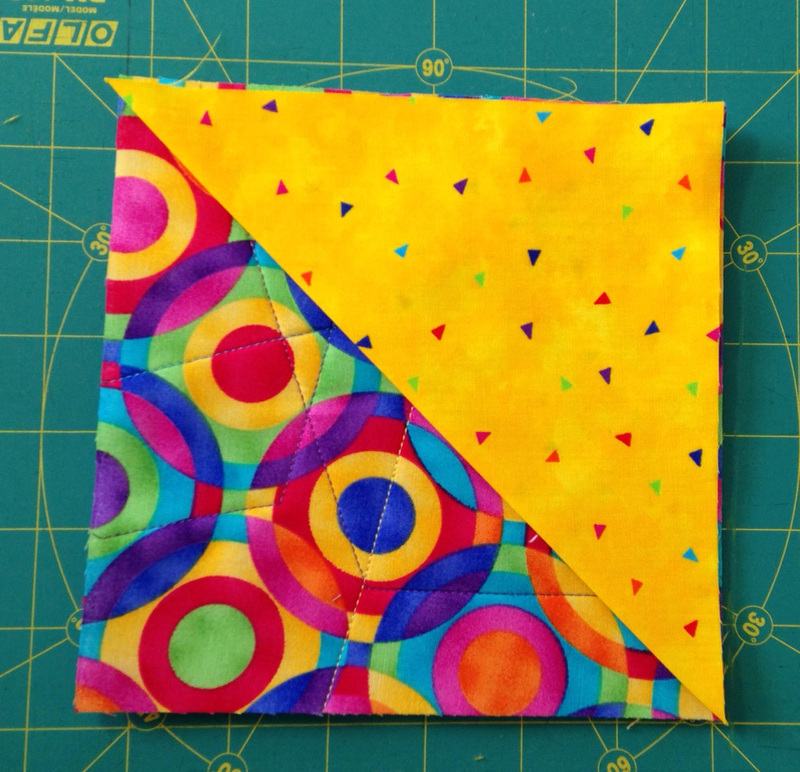 This block started with one of the pieced strips as its center. Then I added random sized strips on all four sides. Finally, I had a set of blocks that I thought were interesting. I selected a medium gray solid and added gray frames around each block so that they were square or rectangular. Notice that the frames are wonky--I 'squared up' the outer edges. Again, I didn't measure anything. Then, I put the blocks on my design wall to see what I liked. After studying them, I decided to put more grey fabric around them to see how they might look as a larger top. I turned them around and laid a couple on their sides--decided I really liked that idea. How did I know what size to make the larger gray pieces? I cut some large and small strips by 'eye'. Since I would be piecing all of them together, I wasn't worried about seams showing. At this stage, I sort of liked it...so I left it on the wall for a few days and worked on other projects. 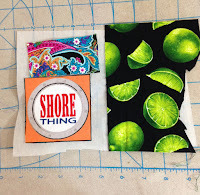 I am the type of quilter who always has several projects going. After a few days, I came back and removed two blocks. I didn't like the block with the white curve--it was a 'hole' that stood out for me. I also took out the smallest square block. I like the look of rectangular log cabins. I was still playing with the layout and continued to move the 4 blocks around and add negative space. And, here's the final quilt. In addition to being a modern take on log cabins, it's also a nod to the traditional 4 patch quilt--only here the 4 log cabins are the patches. Maybe I should call this 4 Patch Log Cabins Dance!! One of my signature elements is in the binding. I randomly added pieces of print and solid to the grey binding fabric. No measuring! the quilting is all straightline with my walking foot. 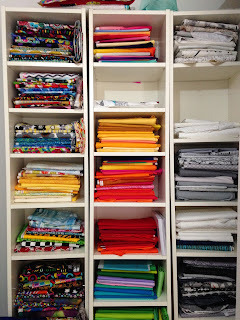 Our knowledge of the color wheel--and all quilters know the color wheel--just look at all those rainbow quilts we make! 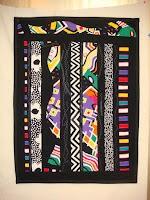 I hope that you enjoyed this glimpse into how I designed one of my quilts. 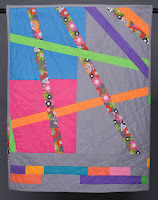 This quilt with more tips on improvisation will be in my forthcoming book on modern quilting. 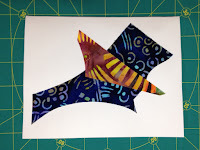 I teach this process as a workshop showing lots of options for making improvisationally pieced blocks and creating a unique layout. I expect to publish my first book by March 1, 2016 so visit my blog for updates.